Visit our selection of new homes for sale. Explore our beautiful selection of new golf course homes. 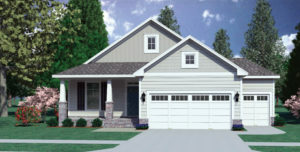 See our move in ready homes for more details. Centered around a Tom Jackson designed 18 hole golf course. Learn more about Wyboo Golf Course. Deercreek At Wyboo has quick access to great boating and fishing at Lake Marion. Learn more about Lake Marion. Our homes have been designed with you in mind. Enjoy the 511 miles of shoreline filled with the beauty of nature and wildlife. Learn more about Lake Marion. You can have a panoramic view of Wyboo Golf Course while sipping your morning coffee. Enjoy nature from your front porch. Located minutes from the heart of downtown Manning, South Carolina. Learn more about Manning, SC. Enjoy the charm of the southern town of Manning, South Carolina. Learn more about Manning, SC. View our selection of custom designed courtyard home plans by C. Jeff Stroud AIA. Imagine living in a new and beautifully designed South Carolina home, in a gated community with sidewalk lined streets, on a top rated golf course, minutes away from a 110,600 acre lake with world-class fishing and navigational access to the ocean, near a 15,000 acre wildlife refuge and in a friendly and historic southern town located in the middle of South Carolina’s four largest cities: Charleston, Columbia, Florence and Myrtle Beach. Welcome to Golf Course Living in the Heart of Lake Country! Nestled in the middle of South Carolina’s lake country and among the fragrant pines lining the Tom Jackson Signature Wyboo Golf Course, Deercreek At Wyboo, is a distinctive and affordable new home community. Our strategically located homes and home sites capture spectacular golf course views and are only a walk to a tee away from this “hidden gem” of South Carolina’s top rated golf courses. 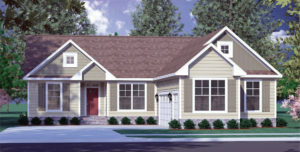 In addition, our homes feature quality construction, open living spaces, beautiful kitchens and spacious master suites. Across the street from Deercreek is another 18 hole course, The Players Course, giving Deercreek residents year round access to 36 holes of golf. Just minutes from our front gate is Lake Marion, South Carolina’s largest lake. With 511 miles of shoreline to explore, our resident water enthusiasts enjoy its abundant recreational opportunities, world-class fishing and navigational access to the Intracoastal Waterway, Charleston Harbor and the Atlantic Ocean. Whether your new home in Deercreek At Wyboo is a primary residence or a second home retreat, you can enjoy a carefree lifestyle with new and exciting adventures at your doorstep. You deserve to experience Golf Course Living in the Heart of Lake Country. Why wait?